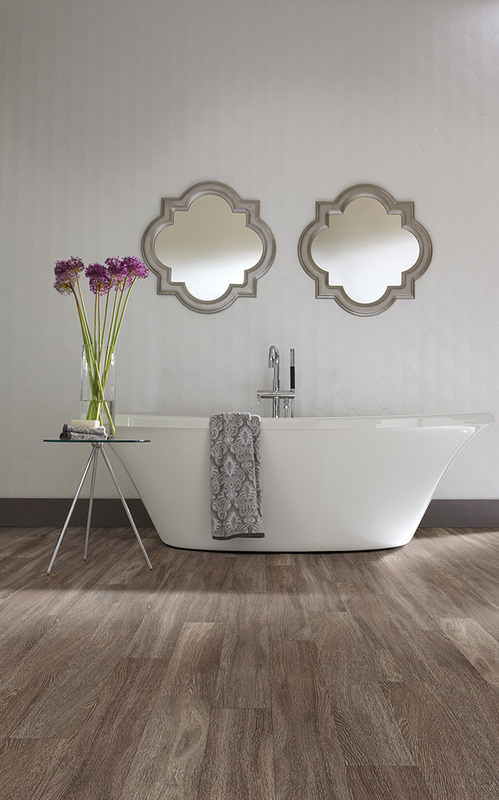 Resilient flooring or luxury vinyl is one of the most popular trends we've seen in flooring. This flooring style brings you the look of high-end stone or hardwood but with all the practical benefits of vinyl. One of the most popular benefits of luxury vinyl? It is waterproof. Bathrooms, kitchens, basements, laundry rooms... any room can have the look you want without concerns about water damage. Our plank resilient flooring is available in a wide array of hardwood designs and colors. You can choose stone, exotic woods or more traditional woods in a wide range of shades and styles. The top layer shows the beautiful look of wood or stone beneath a clear, thick coating designed to resist scratches, stains and wear. Most of our resilient planks also include a cork underlay to reduce noise and increase comfort. These floors look just like natural stone or hardwood and many homeowners agree they are more practical and comfortable. Our waterproof resilient flooring has high durability at an affordable price. This is a floor that you can afford today and enjoy for years to come - in any room of the house. Uneven subfloors? Heavy foot traffic? Pets? Resilient waterproof flooring can handle it all. Learn more about Resilient Flooring. Resilient flooring has brought a whole new range of choices to homeowners looking for the best floor for their kitchen, bathroom or basement. Visitors to our Indianapolis flooring store are amazed at the high quality appearance of these floors and when they hear about the benefits noted above, they are sold on this floor. Looking for waterproof flooring in Indianapolis? Look no further, Kermans has you covered. Stop by our showroom to explore the choices and our free design staff will help you find the look you want.